Iron Art by Orion swing arm curtain rods are available up to 36 inches in length. Base price is for a 12 inch rod. Ball finial shown included. Mounting base measures one inch wide by four inches high and projects one-half inch off the wall. Note: Custom made, approximate two to three week delivery. Custom made items are not returnable. 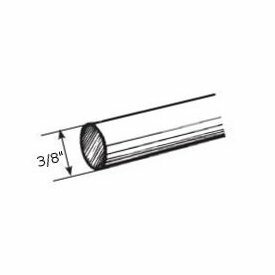 Decorative traverse rod set 28-48" two-way draw projects 3 1/2 to 4 1/2"
Looking for a brushed nickel curtain rod Durable kids drapery rods by Graber. Bright brass, black, brushed nickel and antiqued brushed brass finishes. Projects 3 1/2 to 4 1/2 inches, clearance 2 1/2 to 3 1/2 inches. Rods are metal, slides and finials are plastic. Extra slides available sku 1-428. 1 1/2 inch Windsor curtain rod. Select color from drop down box. This carrier has zinc plated hook to attach your curtain. It is used with Kirsch Architrac 94008, 94005, 94004 and 94003 drapery track systems. Ball bearing carriers make your draperies slide open and closed with the least amount of effort. Great for larger windows or heavy fabrics. This curtain rod is designed to commercial quality specifications demanded by hospitals, hotels and other commercial buildings where high traffic and abusive use is prevalent. Yet, it's sleek 3/4" x 1" profiles blends into any home decor with ease.Order in 18 foot increments. Baton draw, ceiling or wall mount. For pinch pleat or ripple fold drapery systems. Somfy roll up wirefree battery motors for roller and roman shades. Made of vinyl coated fiberglass yarns. 10 percent openness factor makes this roman shade fabric perfect for windows that require more privacy. Comes in 72 and 96 inch wide fabric. Available in cut yardage or 30 yard bolts. White finished twelve foot extruded aluminum curtain rod designed for commercial or residential use. Baton or hand drawn, pre-drilled for ceiling mount. Carreirs available for pinch pleat or ripplefold systems. If cut for shipping is selected, choose FedEx cut for shipping method in the check out. Must be cut less than 104". Arched curtain rods for curved windows, clear 48" to 86"
Clearance 3/4", inside mounting hardware included. For your window arch curtain rod treatment. Arch windows need special treatment. Snap in clear brackets are furnished for installation. Curved curtain rod ships flat, bends to the window contour for installation. Our hundred years of product expertise and unwavering commitment to quality confirm Kirsch's preeminence in basic drapery hardware. Curved drapery rods for windows with curve. Clear curtain rods. Measure the contour of the arch. Rod size is flat length of the rod. 4-0241-1: Arched curtain rods plus oval octagon and circular windows kit to 92"
4-022-1: Arch top clear curved curtain rods 28-40"
7013-058: Arched curtain rods clear, non cracking vinyl 28" to 48"
7370-058: Clear plastic window curtain rod 28"-48" clearance 1 1/4"
Wood brackets for Select Wood 2 1/4" diameter wooden curtain rods, 4 1/2" return. Note: base price for unfinished, colors are more and will display price in cart. 13/16" Cafe window curtain rod 86"-150"
Brass finish. 13/16 inch diameter. Clearance 2-3 inches, returns 2 1/2-3 1/2 inches. Includes 4 bracket-supports.